Our signature tool roll is hand stitched in split leather and is hardy enough to outlast many of it owners. Our eco-friendly tanning process maintains a natural brown finish, punctuated with ivory stitch and silver rivets. It provides practical storage for protecting and transporting tools in distinguished style. The leather securing strap is adjustable, meaning the tool roll is flexible enough to fit as many tools as needed. The Dark Stag Leather Barber Tool Roll is the ultimate solution to keeping your tools protected, either at work or on the move. An astoundingly good looking bit of kit, made with split leather. 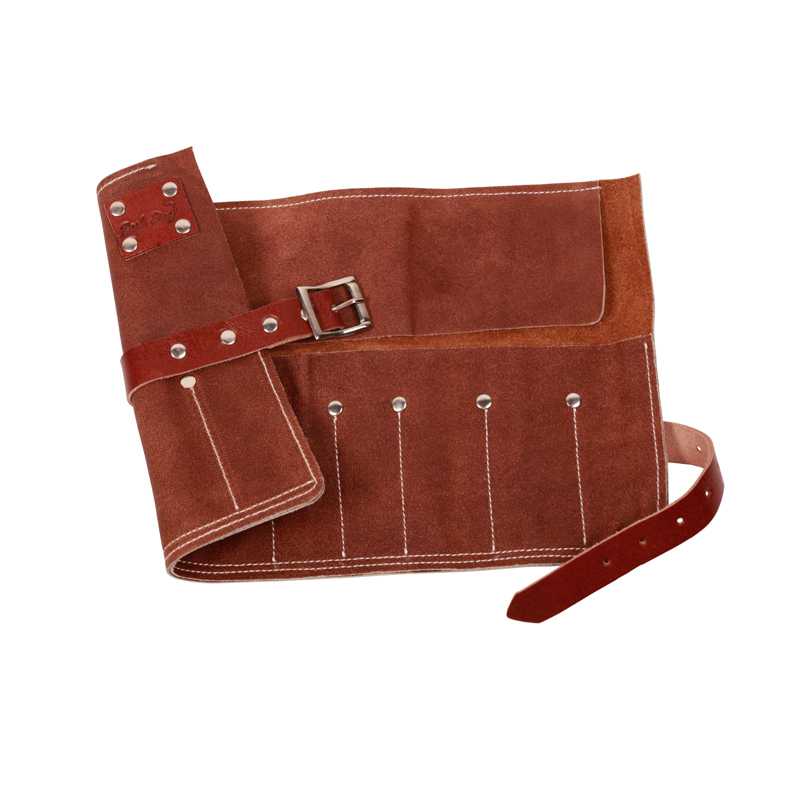 This tool roll is tough and hardy enough to outlast many of it’s owners, yet crafted with style in mind. You don’t have to worry about wear and tear with this tool roll, the outer toughness can withstand almost anything. Whilst the soft inside protects your beautiful tools from scratches, chips and damage. It features a large number of pockets, ranging in sizes, perfect for storing scissors, razors, combs and anything else you can fit inside! The perfect, practical storage for protecting and transporting tools in distinguished style. Our eco-friendly tanning process means the Leather Barber Tool Roll maintains a natural brown finish to the split leather. Split leather is the kind of leather that is often used for workman gloves, meaning it is tough and hard-wearing. But it’s also often used for sofas and chairs, as the tough leather can be sanded down to accentuate the beautiful natural grain. The beautiful brown is punctuated with ivory stitch, by hand, and silver rivets, holding the Barber Tool Roll together securely. The leather securing strap is adjustable, meaning the Barber Tool Roll is flexible enough to fit as much as you want. Carry your tools with confidence and security! Anyone who has ever owned leather boots or clothes knows that they only get better with age. Growing a character of their own that their owner will come to know and love. Overall, this is a stylish accessory that will either look well used and loved by the cool and collected. Or with good care will look good on the elegant and refined. The Dark Stag Leather Barber Tool Roll is a fantastic pairing to the Dark Stag Barber Apron, click the link to see why!